Formulation: Liquid. In 10mM TRIS containing 50mM NaCl and 1mM DTT, pH 7.4. Scientific Background: USP14 is a ubiquitin-specific protease. Little is known about the biological roles of substrates of USP14, but depletion of its homolog in mice cause defects in synaptic transmission. Western Blot analysis: Lane 1: MW marker, Lane 2: 100ng of purified USP-14 (human), (Recombinant) protein probed with USP-14 mAb. 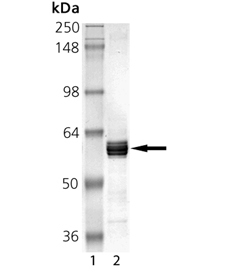 SDS-PAGE analysis: Lane 1: MW marker, Lane 2: 2.0μg of purified USP-14 (human), (Recombinant) protein.